The Chicks are delighted to welcome as our guest today fab author Christina Freeburn, whose latest book, Not A Creature Was Stirring, the first in a new series, is just released. Take it away, Christina! Hi everyone! I’m Christina Freeburn. I write the Scrap This Mystery and the Merry & Bright Handcrafted Mysteries series. Or as I like to say, I write a mix of crafty and crime. I’ve always loved mysteries and crafting. I’ve cross-stitched, painted, created cards, beaded, scrapbooked, crocheted, paper crafted, embellished t-shirts, and vinyl décor which is my new crafting love. There hasn’t been a craft I haven’t tried. I’ve always enjoyed creating whether it’s crafts — or writing. The first book I ever wrote was a teenage romance story when I was in the ninth grade. 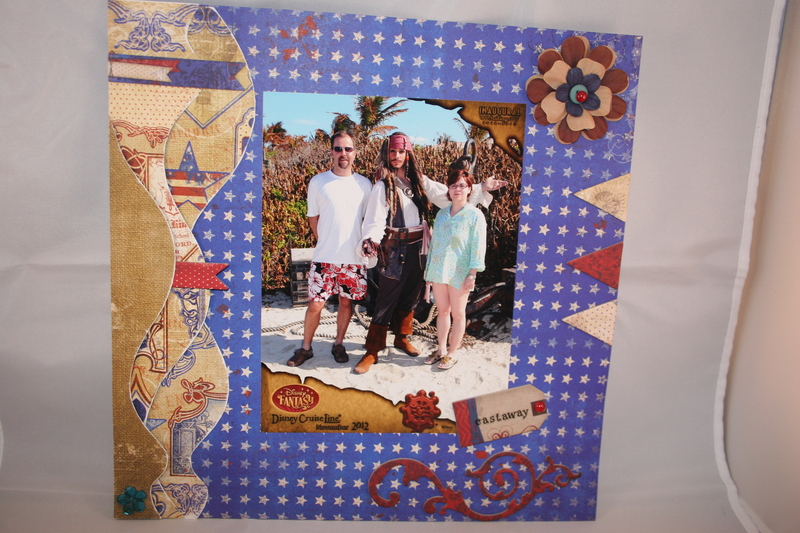 This frame preserves the memory of a Disney Castaway Cay adventure. 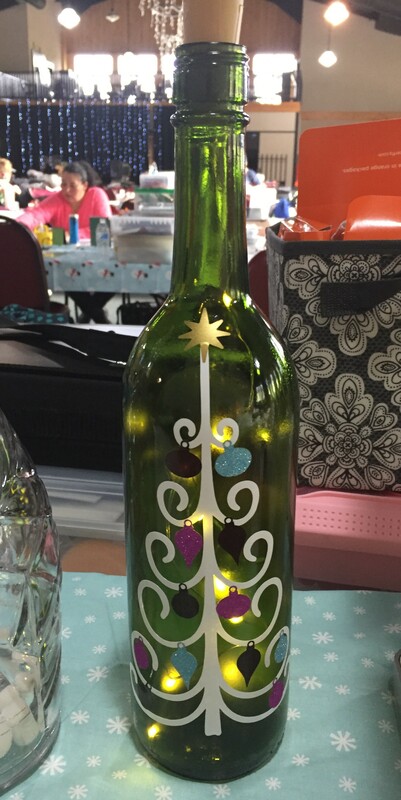 (Below) A decorated bottle is perfect for Christmas. When I started writing cozy mysteries it seemed natural to incorporate crafting into the story. It was something I enjoyed doing, and at that time I was immersed in the world of scrapbooking. I read the magazines, participated (and even moderated) in message boards, and attended weekend crafting crop retreats. Scrapbooking seemed the perfect backdrop for a young woman who was trying to start her life over by returning home. My heroine Faith had a harrowing experience while venturing off to see the world and shake off small town life. She returned to her hometown, and grandmothers, and tried to pretend her most recent past didn’t exist. I loved how Faith used scrapbooking as a way to reconnect with her family and remind herself of the good things in her life. A while ago, I found myself with an unusual problem, I couldn’t get Faith engaged in a plot. It didn’t matter the plot or the length of the story, she just wasn’t interested in amateur sleuthing. It’s hard to write a mystery when your heroine doesn’t want to show up on the page. I knew it wasn’t because I didn’t want to write anymore, I get a little testy if I go days without writing, there was just something causing me and Faith to be on a “break”. Faith and I were at different stages of life, her soon-to-be-married and start a family and me going through the pangs of empty nesting. Maybe the problem wasn’t so much Faith but me. I needed to write so I decided to write a mystery with a new character. Someone crafty. An older heroine who had a crafting business, vinyl crafting, which she balanced with seasonal jobs, because it’s not that easy to make a living crafting. As I usually work out my own struggles through writing, she’d also be an empty nester. I started writing and Merry Winters appeared. Newly divorced. Youngest had moved out. Now with no children to worry about fending for, Merry could focus on herself and her crafting business. It was a time of dreams and excitement…but as happens in a mystery, the start of her adventure came with an unexpected, unwanted, and very dead, stowaway. Since my new crafting obsession was vinyling, I knew it was the perfect crafting business. Plus, there is so much Merry can create: signs, personalized gifts, t-shirts, decorated wine glasses, wine bottles (my favorite!). But I also wanted her to have more of a crafting niche. Something else I loved: Christmas. Merry would be all about Christmas and helping people experience more of the season through the items she handcrafted for gifts and décor. And it’s also an attitude, hope and belief in goodness, that she carries with her all year round. Christina Freeburn has always loved books. There was nothing better than picking up a story and being transported to another place. The love of reading evolved into the love of writing and she’s been writing since her teenage years. Her first novel was a 2003 Library of Virginia Literary Award nominee. 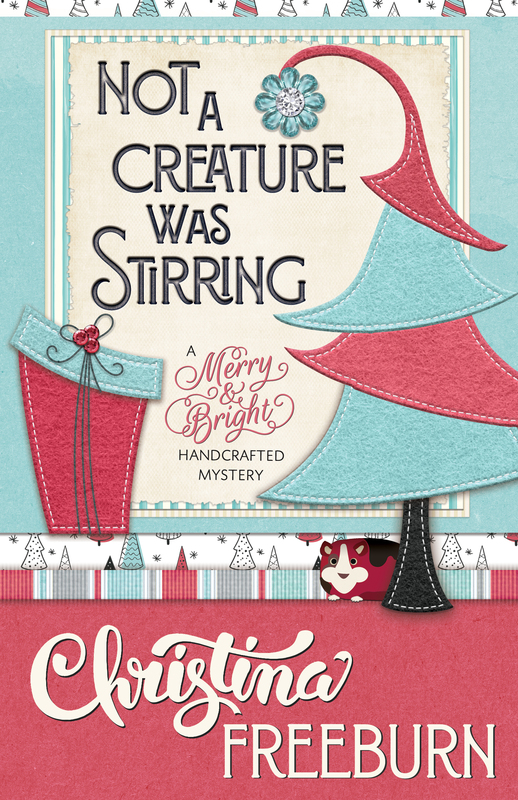 Her mysteries series, Faith Hunter Scrap This and Merry & Bright Handcrafted Mysteries, are a mix of crafty and crime and feature heroines whose crafting time is interrupted by crime solving. Christina served in the US Army and has also worked as a paralegal, librarian, and church secretary. She lives in West Virginia with her husband, dog, and a rarely seen cat except by those who are afraid of or allergic to felines. 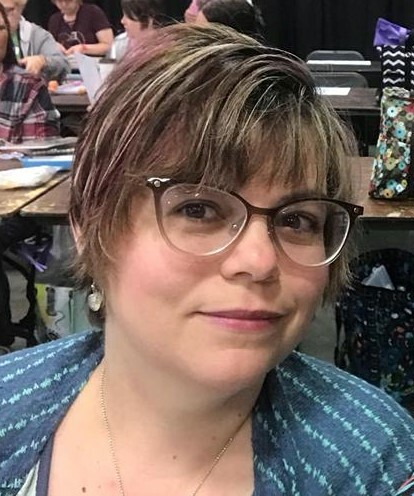 Connect with Christina and learn more about her books on her website. Do you have a craft or hobby you enjoy? What is your favorite creative outlet? Please share in comments. Tags: cozy mystery, crafting, hobbies, scrapbooking. Bookmark the permalink. Christina … I’m adding your books to my towering TBR pile! They sound like a hoot. And that wine bottle is gorgeous. Thanks for visiting us here! Those purses are stunning! I’ve also found that crafting can help me get pass a roadblock in my book. Sometimes the muse just needs to be creative in a different way. Love to craft. This week I am decorating a high heel shoe as part of my Mardi Gras decorations. I’m in my Van Gogh period and started painting in his style. I’d have never thought about decorating a high heel shoe to use as a decoration. Gives me an idea for a scrapbooking retreat I’m going to that has a Wizard of Oz theme. Sounds awesome, Christina! Love the Van Gogh idea! Hi Christina! I don’t craft as much these days, but I used to get a lot of relaxation out of counted cross stitch. Maybe I need to dig out the bag o’ supplies again. My go to relaxation craft is crocheting. There is just something soothing about the repetitive motion and I find that counting stitches helps to quiet my mind. I can’t worry/angst about 10,000 things when I’m counting double crochets and single crochets for a pattern. I did a little knitting in high school but it was more frustrating than relaxing, lol. Congrats on your new series, Christina! Writing is probably my only real creative outlet. I’m horrible at crafts. Really terrible. I am in awe of anyone who can create pretty things. Thank you! I have one daughter who can’t craft, but loves crafty things. So, I get to craft for her. It’s a win-win for us. That premise was so much fun I had to give it a try. I’m not a craft person, but I love RV’s and Christmas. I’m glad I did because it was a fun debut. Thank you so much! I had a lot of fun writing it. Christmas is my favorite time and it’s so nice having a good reason to listen to Christmas music throughout the year. As a mystery author, I worry about this elusive husband. Is there a chance he could be buried in the yard or basement? So glad you could visit the Chicks today, Christina! Your new series sounds terrific, and I love the title–Not a Creature Was Stirring–perfect for a murder mystery. Ha! Craft vinyling is using either a heat transfer vinyl or an adhesive vinyl to create and or embellish other items, like wall decals, wooden signs, t-shirts, cups, or my current favorite decorative wine bottles. And, I’d love for our characters to meet up someday. Hopefully, your new character will be willing to share her story. Good luck on the proposal! Thanks so much for visiting, Christina! Your series sounds wonderful, and I’m in awe of your craftiness!! The only thing I can craft is a list of excuses for why I’m so terrible at crafting. I once made (okay, *assembled*) a pair of earrings for a friend as a birthday gift. I told my son that I was going to tell her that I made them. He responded with, “Ummm…yeah, pretty sure she’ll know that.” HA! I do enjoy the fruits of others’ crafting labors and always promise myself that I’ll try something new with more success. We’ll seeeeeeee! LOL at your son’s comment. Kids. Got to love them! A long time ago, I was trying to sew a stuffed toy (a Teletubby) and one my daughters asked me why I was making a stuffed roadkill doll for their little brother. GUFFAW. You could have the corner on roadkill plush toys! Congratulations on your newest series! Thank you, Lisa. ) Paint nights are so fun. I’ve done a few with my daughter (without the wine) and one with my husband (that included the wine).